Here is a phrase that I often come across: “Convey the essence of the object (or figure, landscape, etc.)”. These words are repeated in books, art classes and demonstrations. Is this just meaningless “art-speak”? I have been wondering… What on earth is an object’s essence, and how can an artist set about conveying it? With my background in both science and art, I have been happy to seek more information. I’ve been looking at writings of neuroscientists such as Semir Zeki as well as those of artists including Delacroix, Matisse and Hockney. Looked at from multiple viewpoints, the subject is fascinating, and I’ll share my ideas with you here in this and some future blog posts. Let’s start by remembering the French Impressionists of the late 19th century. 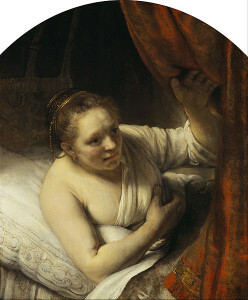 They aimed to depict a fleeting visual impression of the scene before their eyes. Each Impressionist picture conveys the play of light across the scene as it was observed by the artist. 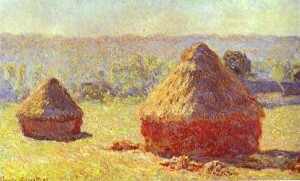 Above: Claude Monet “Haystack, End of the Summer Morning”, oil on canvas, 1891. Monet was very aware of the fact that objects look completely different under natural light at different times of day and in different months of the year. “A rapid rendering of a landscape represents only one moment of its existence. I prefer, by insisting on its essential character, to risk losing charm in order to obtain greater stability”. “Under this succession of moments which constitutes the superficial existence of beings and things and which is constantly modifying and transforming them, one can search for a truer, more essential character, which the artist will seize so that he may give to reality a more lasting interpretation. Can a painting robot convey the “essence” of something or someone? Above: A drawing robot created at Robotlab at the Centre for Art and Media. Though this is technologically amazing, I doubt that robots could ever convey the artistic “essence” of an object or being. A robot with a camera eye could convey a visual “snapshot” of a scene. 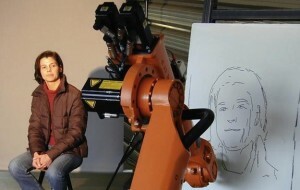 While the robot may create a realistic image (perhaps with sophisticated paint-brush technology on canvas), that robot is not an artist. How can a human artist be better than a robot at conveying the essence of an object? This is debatable as there is no single correct answer (do use the “comments” box below if you wish to add your knowledge or opinion). Unlike the robot, the artist’s aim is to record the physical and emotional experience of looking at the object. All of us humans are capable of experience, emotion and thought, and this puts us ahead of any robot (however photo-realistic the work of that robot may be). 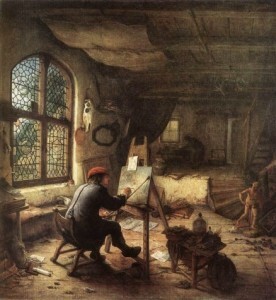 Above: Ostade van Adriaen “The Artist in his Studio”, 1663, oil on wood, 38x33cm. 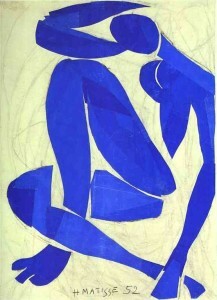 The artist looks, considers, remembers and paints. 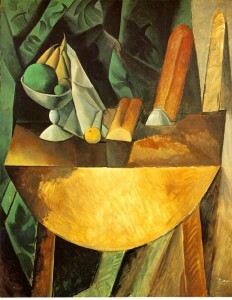 In responding to the object in paint, the artist is free to emphasise, exaggerate or omit elements of the scene. (Would you add anything to the above list? If so, please join the discussion by writing in the comments box at the bottom of this page). It is up to the individual artist as to how far they wish to go with such exaggerations or omissions. The freedom to experiment with emphasising or suppressing these elements is exciting, as it creates an array of possibilities, from visual realism to many forms of abstraction. Do these ideas necessarily lead to abstraction?